When I see a wave, I’m drawn to it. I mind surf it. I wonder about it. I want to ride it, and I imagine riding it. It doesn’t matter where I see the wave or how the wave is created: A river bore. A boat wake. Wind. Disneyworld. Texas. Whatever. Wherever. Salt water. Fresh water. Waves enthrall me. Most surfers are enthralled. “Wouldn’t it be cool if you could ride that?” Probably right now, as you read this, a surfer is watching a wave and mind surfing it. The unknown experience – how would we surf NLand’s wave pool? My friend and I board an early flight from San Diego, with only backpacks and open minds. We arrived at Austin International airport mid-day. NLand Surf Park is 10 minutes from the airport. A brief Uber drive (cost $16.38) through Texas farmland and we came upon the entrance to NLand. An unassuming driveway with banners which invite us to eat, drink and surf. Three flags are flying high in the sky: USA. Texas. NLand. Out of the Uber and literally fresh off the plane, eating drinking and surfing sounds perfect. I’m geeked up. I’m peering around. I’m trying to get a glimpse of the wave. My excitement level is just shy of a 10- year-old kid arriving at Disneyland, and I embrace it. I’m 52. Our kind greeter gave a quick tour and pointed us in all the right directions: “Sign the waiver here; get food there; watch the intro video down there; rent surfboards over there. Have fun!” It was without a doubt the first time I’ve been to a surf spot and felt so welcome. We had two-hours prior to our first heat (yes, each one hour session is referred to as a “heat.”) in the wave park. Waiver signed, we decided to eat. The food was very good. Two flavorful Mahi Mahi tacos with cabbage, pico de gallo, and chile lime cream sauce. $12 seemed fair, especially considering how tasty the tacos were. You can sit inside with air-conditioning or outside with a slightly better view of the waves as they peel off. Bottled water was pricey at $4. A quick money saving tip: get a water cup and drink the water from the fountain. The menu contains plenty of health conscious options (Quinoa & Avo Bowl, Poke, Edamame) and frankly I’d eat at this restaurant again — with or without the wave pool. The food was delicious and I wasn’t stuffed, but perfectly primed for two hours in the park. NLand is well stocked with a variety of proven surfboard models from Lost and Channel Islands. I chose a 5’ 9” Lost Puddle Fish with a quad on the suggestion of Sam, the knowledgeable and friendly NLand board caddy. Board rental is $25 and well worth it as bringing my board would have cost a minimum of $25 each way. There is also an option to buy ding insurance. The park consists of nine football fields of water split in two, right down the middle, vertically, by a pier. On the left as you looking down the pier is the West Bowl. On the right is the East Bowl. Underneath the pier is where all the technology and magic happen. A pulley system pulls (pushes?) an underwater plow, which creates the wave. At least that what it looks like to the naked eye. The water temperature was 68 degrees. The fresh water color – brackish and/or brown — not silty or dirty. I thought I smelled some chlorine, which I appreciated. I was never concerned about the water quality (granted, I did have 10-year-old grom goggles on). It seems NLand management has it figured out. I’m out there. My friend and I suited up watching waves roll through. The wind was light, generally glassy and, when the wave/pulley apparatus drove into the wind, occasionally threw gentle offshore plumes into the sky. We were psyched. Our time was soon. A surf guide met us at the lagoon entrance and gave a quick overview and helpful pointers. 1) First wave of the heat is the smoothest. 2) Hang as close to the pier as possible — there is a fence on both sides of the pier, which juts down into the water. This fence keeps the pulley system enclosed. When it comes to catching waves or dodging other surfers, the fence is your friend. Stay close to the fence i.e the pier. 3) There are NLand Surf Park banners hanging from the pier. These are your lineup markers. Lineup with the banner. When the pulley and wave start to move toward you and they get about 15 yards away, turn and start paddling. Hug the fence. Do not paddle away from the fence. The fence is your friend. Once the wave is upon you… dig hard!! The natural force of the wave will push you toward the middle of the lagoon. Not good. Hug the fence. 4) Immediately upon catching the wave do a quick mid face turn and get going toward the fence. All of the forces are pushing you away from the fence. It is very easy to get passed by. Do not lay into deep fading Tom Curren bottom turns. You will get passed by. Do not do a round house cutback. You will get passed by. Hug the fence. 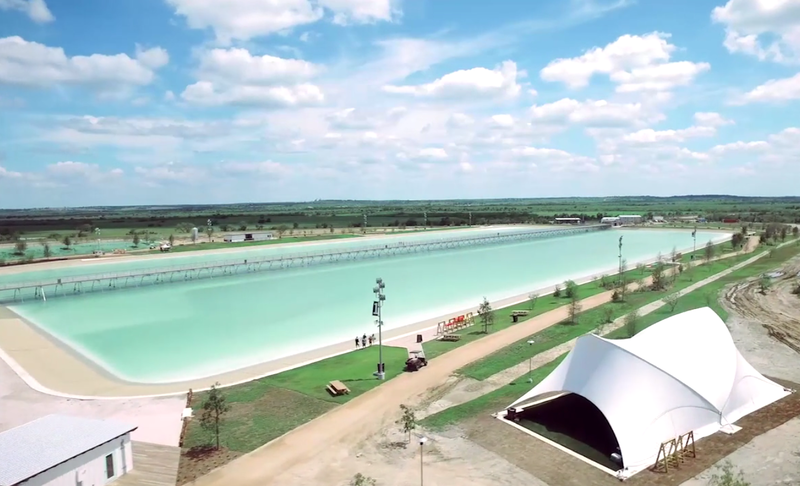 There is no drama when you surf NLand wave pool. There is order. You wait your turn. Then you go. No back paddlers. No psychological war games. No puffy chests. No spitting to mark territory. No crossed arms. No scowls. It’s all love. Order does that. This is part of the NLand experience I found particularly refreshing: the understanding and the happiness that flowed from the order. There was no pecking order. Just order. I met Mike G. a sports psychologist from Redondo (his pod here https://findingmastery.net/category/podcasts/ ). Mike was visiting Austin on business and decided to try the waves at Nland. I spoke with a large, athletic man from Chicago who rode a boogie board. He had a big smile. He rode with confidence and he dominated every wave he caught. There were many other people who I shared smiles, and good vibes with, not the least of which were the NLand Surf Guides who were in the lagoon with you, offering encouragement and pointers. It was now my turn. The first wave of the heat. A right-hander. I’m hugging the fence, anxious, my overblown California surf ego on the line. If I fall, all of those eroded plastic NSSA trophies will be for naught. Thirty years of fake will be exposed like the wrinkles from my failing Botox. I’m inwardly chanting: Must Make Wave! Must Make Wave! I’m sure the sports psychologist would approve. It’s a high-pitched whirring. Followed by light mechanical gear clanking. Brain chemistry is triggered, like a notification on my iPhone. The sound of the wave-making pulley creates a little jolt of excitement: dopamine. I hear this sound and I know my time is at hand. Further proof, the large concrete fin attached to the plow that runs underneath the pier starts moving toward me. I’m sitting next to the fence waiting as it approaches. I see it. I hear it. The situation is completely bereft of Zen. I’m thinking way too much — never a good thing. I paddle hard, making sure to hug the fence, I pop-up to my feet and away I go. The wave is fast. Not like charge-down-the-line-at-Rincon fast. No, it’s hug-the-fence-or-get-pushed-into-the-lagoon fast. It feels like I’m fighting it, instead of flowing with it. I fight the power for 100 yards and eventually kick out. One completed ride under my belt. Success, perhaps, but by no means mastery. Next wave: I take off on a left and I’m just a smidgeon late. A front toe drag results in my foot placement just a fraction off center. I adjust but it is too late. I’m now at the bottom of the wave, watching helplessly as it peels on without me. There is no time for adjustments. 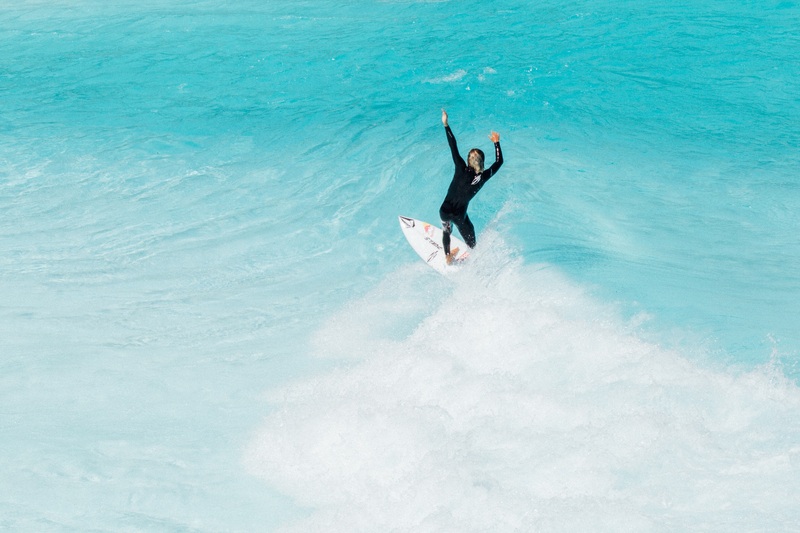 Riding high on the wave face is the ticket. Never bottom turn. Only mid-face turns. The higher I stay the more I flow with the power. The lower I go the more I fight the power. The one-hour heat goes by quickly. I was in line to catch seven waves. I blew it on two of them and completed five. My friend and I take a two-hour break between heats. We spend the time eating more food (quesadillas and chips), de-briefing the session and cruising the pier for shameless selfies and Insta-fodder. The next heat is all systems go. It’s just the two of us. No waiting. I probably caught twelve waves. Maybe more. In a related story, my buddy broke his leg. A freak accident riding a wave. He hobbled in with the help of the NLand lifeguards and I was left alone, catching every single wave. I was exhausted. He was traumatized. We had a great time, well, up until the broken leg part. Then it was, ah, just me having a great time. NLand is pricey. $90 a heat. Would I do it again? Probably. Austin is a cool place. Great food, eclectic music, there is plenty to do and see. Is the wave Lances Right? No, of course not. An open mind is required. A free spirit. NLand Surf Park offers fun, exciting, rippable stomach to chest high waves. What’s not too like? Of note: My surfing experience at NLand was advanced skill set. I surfed the “reef” wave. There are great options for first timer surfers, continued learning or intermediate skill level surfing. From what I saw, the instruction and the beginner waves are ideal for a learning experience. A vacation idea: Fly to Austin. Surf a few sessions at NLand then head over to your hotel for a nap. Have dinner at one of Austin’s eateries. I’ll suggest Tex-Mex at Peleons. Then check out some live music. The next day you surf again, brunch and then head over to the UT campus for a Longhorns football game. After the game you fly back to California.